The word “gest” is old English, and a bit of a pun. It could mean a “jest” or a “guest” and it has an ancient meaning as a “heroic deed”. Normally Robin likes to entertain his guests in Sherwood Forest with food and wine, before relieving them of their gold. But in this story his guest is a sad Knight who has no money to surrender. Instead, Robin lends him money so that he can repay a loan to the cruel Abbot. 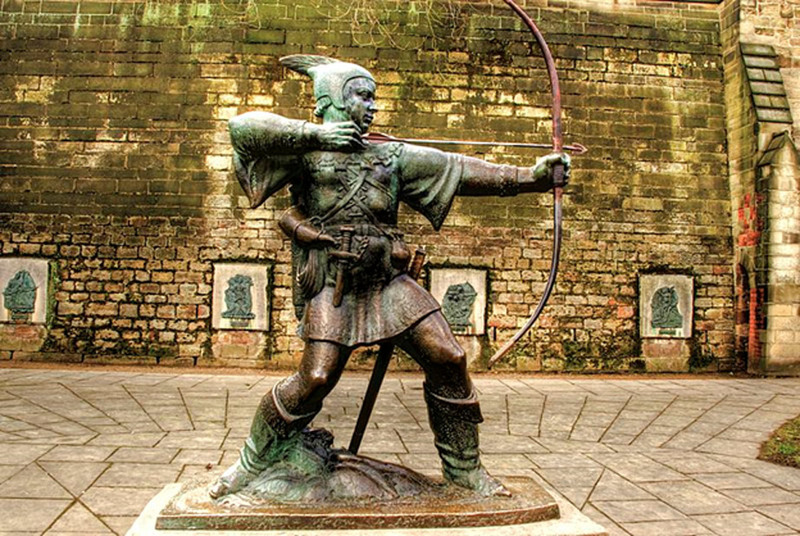 As in all Robin Hood stories, anybody in authority is a baddie (except King Richard) – and that includes the leaders of the church who are abusing their power. Of all the thieves and highway robbers who have ever lived, by far the politest was Robin Hood. He liked to entertain those he robbed as guests in his own home. Although his home was a rough camp in Greenwood, which was in the thickest and darkest part of Sherwood forest. His table was always heavy with rich food and wine. He was very choosy about those whom he invited to his lair. He only liked to rob the best sort of people; nobles, knights, barons, and leading figures of the church. 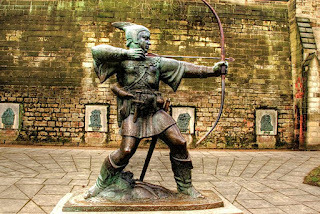 He treated his victims with such great courtesy and hospitality that afterwards some of them said that it had been a privilege to have been robbed by Robin Hood. One day Robin and his men had been out shooting game in the King’s forest. It was this habit that had made them outlaws in the first place – for the King’s brother, John, had declared that all the forests belonged to him – and anyone who hunted there without his permission would face severe punishment. King Richard himself would not have deprived the foresters of food, but he was away fighting wars overseas. While he was away, his brother John ruled England with cruelty and injustice. On this day the hunting had been good, and Robin Hood and his men were looking forward to a fine dinner. Little John’s real name was John Little, but everyone called him Little John because he was so huge. He was six foot five inches tall and as broad as a tree. He was Robin’s most trusted partner in crime, and feared nothing and nobody – not even Robin. Although he was hungry, he agreed to go and find a guest. He took two of the best men – Will Scarlet and Much the miller’s son. They went up to the highway to wait for a suitable guest to come along. The road was quiet and they waited an hour or more for a suitable victim. At last a knight came riding down the road. As he drew near they saw that he was lost in thought, and there was a look of great sadness on his face. The three men jumped out and pointed their arrows at his chest. Their long bows were so powerful that they could easily pass through any armoured breast plate or chain mail. “And who might your master be?” asked the knight. “Welcome to Greenwood gentle Sir Knight, all ours is yours.” They washed their hands together in the stream, and then they dined on pheasant, trout, cuts of venison, and barley bread, then swilled it down with plenty of red wine. The sad expression returned to the knight’s face. “I have but ten shillings,” he said. Robin had not entertained such a poor guest at his table before. “How come so poor?” Asked Robin. When the knight and Little John arrived outside the Monastery, they changed into their poor clothes again, before entering and asking to see the Abbot. “Not one penny,” replied the knight. At this the Abbot swore a great oath and roundly cursed him. “Out false knight! Speed out of my hall!” he shouted. The Abbot had no choice but to hand back the deeds to the knight’s land – although he was sorry to do so, for it was worth a good deal more than four hundred pounds in gold. A year passed, and the knight gathered together four hundred pounds to repay his debt to Robin. He also made 100 arrows and had them plumbed with peacock feathers as a gift to show his gratitude. A good friar arranged a meeting with Robin beneath a great oak tree in Greenwood. On the way, the knight stopped to watch a wrestling match between the son of a nobleman and a peasant. The two men pushed, grappled, arm locked, tripped, and threw each other, but the peasant was the stronger, and he soon had the nobleman’s son pinned to the ground and unable to move. He claimed his prize – a pound in gold – but the nobleman’s friends would not pay. Instead, the judge of the contest drew his sword and was about to kill the peasant for his impudence. Seeing this, the knight rode up and declared, “The man that harms the victor of this match will have to contend with me!” The nobleman’s friends did not want to take on a knight, and they released the peasant. The peasant agreed, for he knew that if he did not, the noblemen would get him later. “Then take these,” said the knight, and he showed Robin the 100 arrows plumbed with peacock feathers. That evening the gentle knight was a guest at Robin’s table for a second time, and they feasted until they could eat no more.